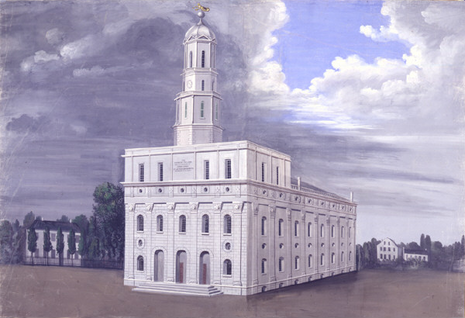 Joseph and Louisa were married on April 5, 1841, “in a grove Near Main Street in the City of Nauvoo, The Prophet Joseph dictating the ceremony and Br Nobles repeating it after him.”, remembers Erastus Snow, Louisa’s brother-in-law. To help keep the union secret, Louisa wore a man’s hat and coat as disguise. Joseph Bates Noble recalled that after the ceremony, the couple spent their wedding night, “Right straight across the river at my house”. Noble said he encouraged them to, “Blow out the lights and get into bed, and you will be safer there”. The religious ceremony of celestial marriage included the possibility of widowed, married, or single women being sealed in a priesthood rite to founding prophet Joseph Smith. The promise was, if faithful, they would enter the celestial kingdom of heaven with themselves, their families, and be associated with Smith for eternity. This was known as spiritual wifery, celestial or heavenly marriage, plural marriage, or the principle. The first recognized sealing in Nauvoo was that of Louisa Beaman to Joseph Smith by Joseph Noble in 1841. Women were secretly married (or in LDS language sealed by the priesthood) to Smith or other men without courtship. Many of the young single women because of their commitment in a plural relationship would not be able to marry a man near their own age.